Water conservation measures combined with the recent rainfall have replenished Port Alberni’s Lizard Lake water reservoir. Efforts by Port Alberni residents to conserve water during the recent summer drought have been a great success, according to city engineer Guy Cicon. “We’ve really decreased consumption,” Cicon said. Given the drought condition plaguing Vancouver Island this summer, that’s quite an achievement. A mere 82 millimetres of rain have fallen at the China Creek dam, the city of Port Alberni’s main water source, this summer. 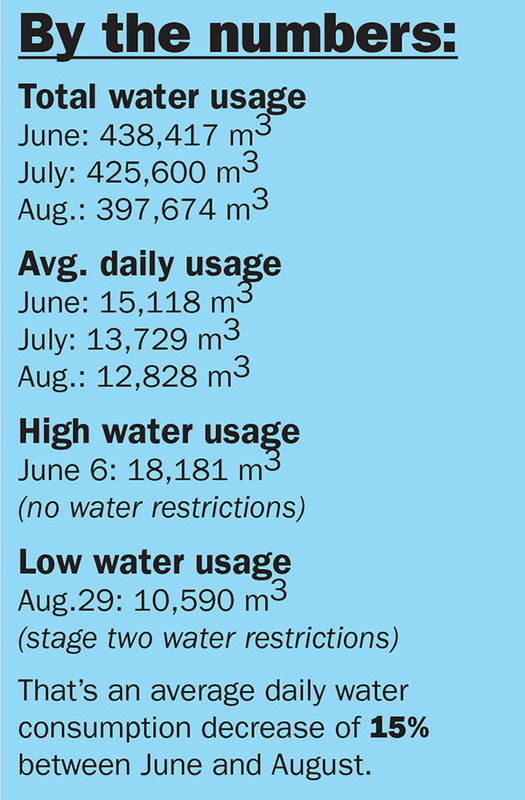 But despite the lack of rain or the fact that both May and July 2015 were the hottest ones of record since 1993 (with June not far behind as the third hottest), Port Alberni residents have cut their water usage by almost 2,300 cubic metres since June 1. According to city water works statistics, average water usage dropped from 15,118 cubic metres in June to 12,828 cubic metres in August. And despite July being a scorcher, residents average only 13,729 cubic metres daily. It’s not by accident; the city imposed stage one water restrictions on June 8 after seeing its main water reservoir at Lizard Lake drop to levels not ever seen so early. Despite water conservation measures, the gauge by the Lizard Lake slipway read 30 centimetres lower by July 13, when Cicon made the decision to go to stage two restrictions. It was something that Cicon, who’s been with the city for close to two decades, has never had to do before. Between much lower water consumption, a slightly cooler August and the 63 millimetres of rain that fell at the China Creek dam prior to the Labour Day weekend, Cicon is feeling optimistic. “We look at three pieces when deciding on water restrictions; the weather, water consumption and lake levels,” he said. Rain the last weekend in August pushed the water level at the Lizard Lake gauge up by around 40 centimetres. While the city will continue to monitor weather, consumption and lake levels, Cicon said that if the current conditions stay stable, he’ll advise city council to move back to stage one water restrictions at their Sept. 14 meeting.